Note: The following is a guest post by Tableau Zen Master Steve Wexler. I spend a lot of time with survey data. Much of this data revolves around gauging people’s sentiments and tendencies using either a Likert Scale or a Net Promoter Score (NPS) type of thing. Here’s an example of gauging sentiment using a five-point Likert scale. Here’s an example of measuring tendencies, using a four-point Likert scale. 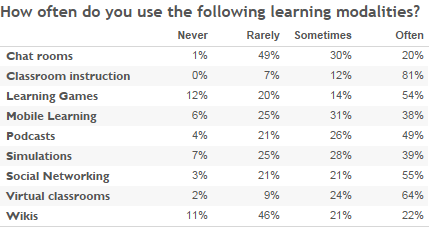 How often do you use the following learning modalities? So what’s a good way to visualize responses to these types of questions? Over the past ten years, I’ve spent thousands of hours working on the best ways to show how opinion and tendencies skew one way or another. I have found that in most cases, a divergent stacked bar chart helps me (and more importantly, my clients) best see what’s going on with the survey responses. See an example of a divergent stacked bar chart (also called a staggered stacked bar chart). Work through a data visualization improvement process. Show sentiment and tendencies over time. Present a dashboard that will allow you to experiment with different visualization approaches. Note: For step-by-step instructions on how to build a Likert-scale divergent stacked bar chart in Tableau, check out my previous blog post. Here’s the redesign using a divergent stacked bar chart. In both charts, the overall length of the bars is the same. But with the divergent approach, the bars are shifted left or right to show which way a candidate leans. I, and others I’ve polled, find that shifting the bars makes the chart easier to understand. 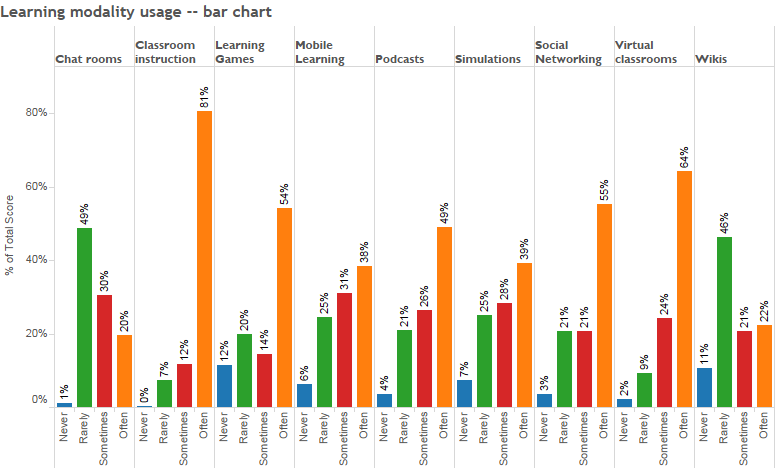 Consider the table below that shows the results from a fictitious poll on the use of various learning modalities. I can’t glean anything meaningful from this. What about a bar chart? Wow, that’s really bad. What about a 100% stacked bar chart? This is certainly an improvement, but the modalities are listed alphabetically and not by how often they’re used. Let’s see what happens when we sort the bars. It’s taken us several tries, but it’s now easier to see which modalities are more popular. But we can do better. Here’s the same data rendered as a divergent stacked bar chart. Of course, we can also look take a coarser view and just compare sometimes/often with rarely/never, as shown here. I find that the divergent approach speaks to me and resonates with my colleagues and clients. A while back, Helen Lindsey was kind enough to send me some data that contained responses to some Net Promoter Score questions. Specifically, folks were asked to rate companies/products on a zero-to-ten or one-to-ten scale. We compute NPS by subtracting the percentage of folks that are promoters (i.e., people who responded with a 9 or a 10), subtracting the percentage of folks that are detractors (i.e., people whose response fell between 0 and 6), and multiplying by a hundred. But sometimes my clients have questions that are on a ten- or eleven-point scale but instead want to compute the percentage of folks that responded with one of the top three boxes minus the percentage of folks that responded with the bottom three boxes. I realized that the Lindsey data set could provide a type of “sandbox” where we could experiment with different sentiment scales including NPS, top three minus bottom three, five-point Likert, three-point Likert, and two-point Likert. Let’s look at the results of some of these experiments. 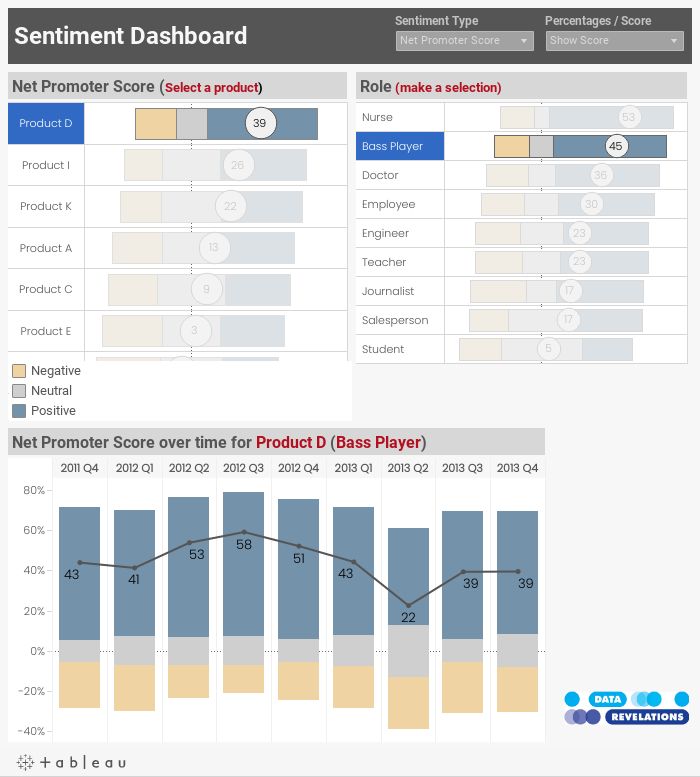 Here are two ways we can visualize NPS data. 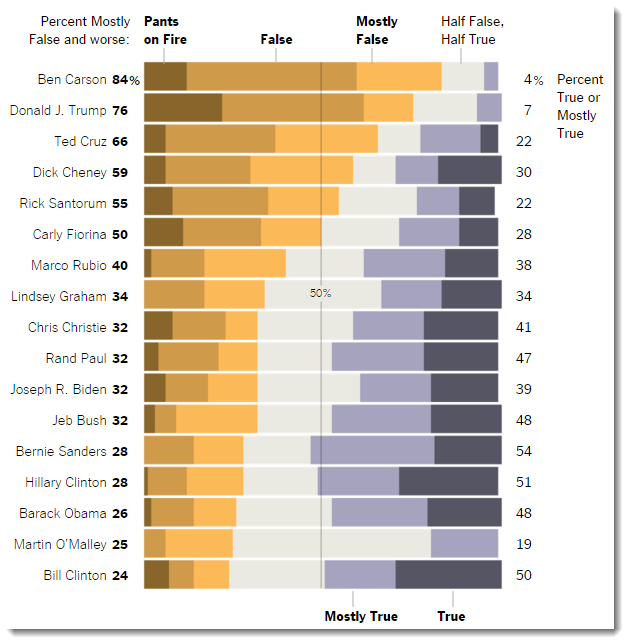 The first shows the percentages of people that fall into the three categories. Here’s the same view, but with the NPS score superimposed over the divergent stacked bars. It turns out that divergent stacked bars are great at showing NPS trends over time. Here’s a view using percentages. Here’s the same view but with the score superimposed. Note: For some other interesting treatments of showing sentiment over time, see Joe Mako’s visualization on banker honesty. Here are the associated visualizations. Here’s the same NPS data but rendered using a five-point Likert scale. And here’s the same data, but divided into positive, neutral, and negative sentiments (three-point Likert). Finally, here’s the same data, but only showing positive and negative sentiments (two-point Likert). Here's a dashboard that lets you to explore different combinations of the one-to-ten scale. I strongly recommend you do NOT give your audience all these scaling options; these are here for you to experiment and see how the visualizations and ranking change based on what scales you use. The only option I would present to your audience is the ability to toggle back and forth between percentages and scores. 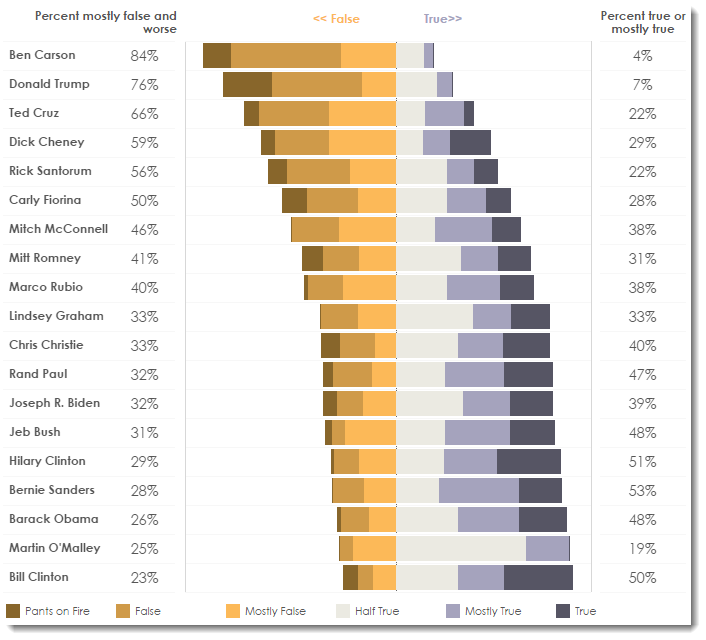 Check out additional works by Steve on his Tableau Public page and on his blog, Data Revelations. Such a great way to show ordinal information. If you don't happen to have compiled survey data, you can still accomplish the same effect with LOD expressions, too. I've been using it to show cancelled, current, and completed orders. Thanks for the article!